The trim router has always been a handy tool to have around the jobsite, and thanks to advancements in technology, these little guys have become more and more powerful over the years, at no cost to their compact size. Originally intended for only trimming laminate, these "Trim" routers are now powerful enough to handle many of the jobs of their bigger brother. Rockler has obviously seen that the new generation of trim routers are being underutilized, and have come out with a new trim router table to bump them up to their true potential. The Rockler Trim Router Table is made out of 3/4-inch MDF that is wrapped in vinyl and sizes in at 11-1/2" x 15-1/2". The table top is pre-drilled to accept the included adjustable fence, and included 1/4-inch thick acrylic router base. The base has a router bit clearance of 1-1/2" and is pre-drilled to accommodate most trim routers. What you wont find with this router table is a router cabinet. 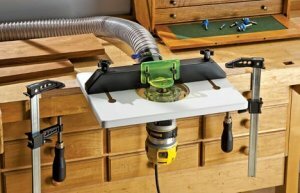 The Rockler Trim Router Table is so small that it can simply be clamped to overhang off of a horizontal work surface. If you are on the jobsite, you can even use the tail gate on your truck. If you want to put your little trim router to work, the Rockler Trim Router Table can be yours for $59.99. For an added $11.29 you can get the Rockler Dust Port and breath a bit better.